Traditional Games and Ethnosport Federation of Russia with the support of Moscomsport (Moscow City Department of Physical Culture and Sport) revived hosting traditional games on Trinity, which took place in the Moscow Lianozovsky Park of Culture and Leisure. 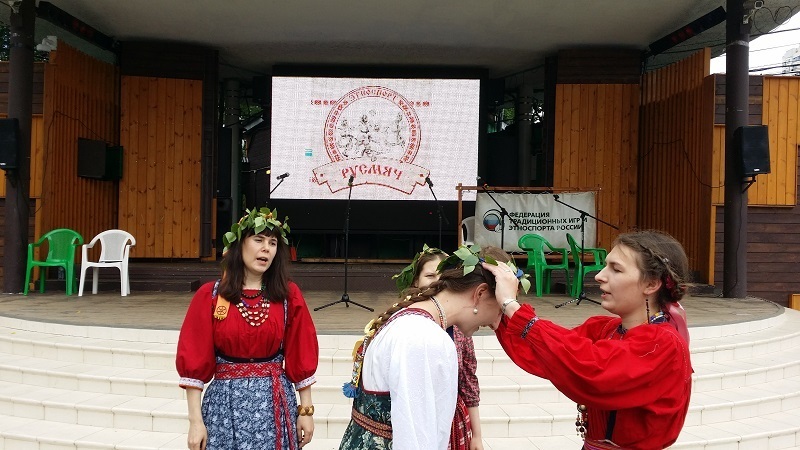 In accordance with the tradition of Trinity Sunday, the event started with a rite of green svyatki (*a set of traditional festivities), which women perform wearing a wreath of leaves. Such maiden festivities are ritual chants while passing around the audience, representing the bride show. On this holiday, girls of marriageable age would discard their wreath as a symbol of girlhood, which signified their transition to adulthood. Youngsters would compete before the girls. The third year of hosting Russian games established a tradition to start with Rusmyach (Russian ball) and Kila, then – stick pulling, za-vorotok wrestling, and finally, youth play serving as a warm-up for stand-up fight. In addition, in other sites there were other activities, such as a game of ryukhi (skittles), knucklebones, lapta (a game similar to rounders or baseball), as well as traditional archery and klyushkovanie (similar to hurling). The games were constantly accompanied by explanation of their features and rules. Singing contests this time were joined by a contest of children, studying in music schools and clubs. In the central area of the park, Ilya Akhromeyev held a big workshop in folk dances, in which over a hundred people took part. Dances, just like the rest of the Trinity holiday, were held to the accompaniment of musicians of the "Play City" Creative Association. The event was held with the support of the following partners: the Fund for Protection of Historical and Cultural, Spiritual and Moral Foundations of Russian Civilization "Svyatoslav", Creative Association "Play City", Martial Arts Center "Russian Sparring", Wall on Wall Stand-Up Fight Club (Moscow), Stand-up Fight Club “S.W.O.R.D”, Martial Arts and Ethnosport Club "Slavs", Russian Ancient Martial Arts Club "Kolo", the Regional Public Organization "Youth Choose the Sober Capital", a non-profit partnership "Atmanov Pugilism", Center of Patriotic Education "Stratilat", the State Academy of Slavic Culture, Center of Living History "Present Past", and the amateur ethnosport and folk groups. Second team – "The International"